Just in time for the start of the Christmas period my latest podcast is looking at one of the more recent films about Jesus - 2006's The Nativity Story. (Cast: Ken Colley - Jesus, Sue Jones-Davies - Judith, Rest of Cast - Graham Chapman, John Cleese, Eric Idle, Terry Jones, Michael Palin, Terry Gilliam). It's claimed that Jesus is the most watched film on the planet even though it has no special effects or star actors and is frequently criticised by reviewers. It's also one of the few films to be based on a single gospel rather than all four. (Cast: Brian Deacon - Jesus, Rivka Neuman - Mary, Joseph Shiloach - Joseph, Niko Nitai - Simon Peter, Mosko Alkalai - Matthew, Kobi Assaf - Philip, Eli Cohen - John the Baptist, , Eli Danker - Judas Iscariot, Peter Frye - Pontius Pilate, Nisim Gerama - Thomas, David Goldberg - Judas son of James, Richard Kiley - Narrator (Luke), Miki Mfir - Simon the Pharisee, Yitzhak Ne'eman - James, Richard Peterson - Herod, Milo Rafi - Simon Zelotes, Gad Roll - Andrew, Alexander Scourby - Narrator, Daud Shah - Adam, Talia Shapira - Mary Magdalene, Shmuel Tal - John, Michael Warshaviak - Bartholomew, Leonid Weinstein - James son of Alphaeus). After a month's absence I'm back looking at Godspell based on the hit musical Stephen Schwartz and John-Michael Tebelak. It's one of the more heavily criticised Jesus films as it has not dated at all well, but the musical still remains possible and it's attempts to reinvigorate Jesus's teaching is still interesting today. (Cast: Victor Garber - Jesus, Katie Hanley - Katie, David Haskell - John / Judas, Merrell Jackson - Merrell, Joanne Jonas - Joanne, Robin Lamont - Robin, Gilmer McCormick - Gilmer, Jeffrey Mylett - Jeffrey, Jerry Sroka - Jerry, Lynne Thigpen - Lynne, John-Michael Tebelak - Pharisee Monster [voice]). Unfortunately I haven't had time to create a podcast entry this month and as the next couple of weeks look fairly busy I won't be able to get around to recording the next one until the middle of May. Apologies to anyone who was looking forward to it. The Passion is a BBC1 drama that aired this Easter in the UK and will be shown in the States next Easter on HBO. The UK broadcast was stripped over 4 episodes between Palm Sunday and Easter Sunday, though the HBO version might be over 3 or even 6 nights instead. Being a TV drama the series should be coming to DVD in the next few months. Mark Dornford-May's Jezile (Son of Man) is the first of two films about Jesus being released next month, so seeing as this is the one that I have seen, I'm going to look discuss it this month and the BBC's The Passion next month. The first Jesus films podcast of the year, on the Visual Bible's The Gospel of John, arrives late, and with the odd bit of distortion that I've not been able to fix! Apologies to regulars I'll try and get it sorted and re-post. I comment on both versions of the film the recent 2 hours cut as well as the complete original. This month I'm looking at Mel Gibson's The Passion of the Christ which became one of the most controversial, and successful films of all time when it was released in 2004. Back then it was the film that everyone seemed to have an opinion on, and its success has paved the way for a score of films about the Bible to be created. This month I'm looking at Cecil B. DeMille's silent classic The King of Kings (1927). The recent Criterion Collection DVD release for this film included both the widely seen 1928 version of this film and the original, longer 1927 cut. Jesus (1999) is one of the latest Jesus films being released only 8 years ago. It first aired on CBS in America and Sky in the UK, but has been broadcast many times since in a number of different countries. Whilst unmistakably set in the 1st Century it takes a very modern approach to the story. 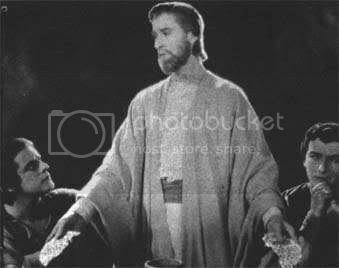 The Life and Passion of Jesus Christ (1905) is the earliest Jesus film that is widely available today (although the exact release date of the DVD version of this film is not entirely clear). The film is a million miles away from today's slick movie making, yet there's something very genuine about it's earnest depiction of it's subject. This month I'm discussing the Russian-Welsh animated Jesus film The Miracle Maker. Released in 1999 it's the most recent film I've discussed so far, and whilst, surprisingly, it's still not that well known, the list of those who admire it is certainly growing. This month I'm discussing Denis Arcand's Jésus de Montréal (Jesus of Montreal). The film tells the story of an actor who gets the role of Jesus in a play, and begins to find his real life becoming more and more like the one he is portraying. After a month off for Christmas (! ), this month I'm looking at George Stevens's The Greatest Story Ever Told. Whilst the film did poorly at the book office, there's much to appreciate in the film despite its flaws. This month I'm looking at Pier Paolo Pasolini's classic film Il Vangelo Secondo Matteo (The Gospel According to St. Matthew), which is probably the film that most critics consider the best of all Jesus films.